Home › Kram's Korner - From the Club Level › Phan Nation Rises Up–Officially! This is a big deal. As we know, the IronPigs never wanted a “Fan Club”–at least not the kind run by fans. Many minor league teams don’t want an officially endorsed and recognized fan club, for a variety of reasons. In minor league hockey, it’s more common to have a “booster club,” but the Phantoms organization is so good and so strong that they don’t have a need for that type of support. It took a whole year of negotiations, reassurances, tax registrations and paperwork, more meetings, official bylaws and stuff I probably don’t even know about–from a dedicated group of officers to achieve this status. It was made official on Monday, January 18 and announced to members in attendance at the meeting last night. So what does it all mean? 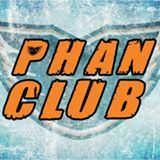 Well, it means that the Phan Club is now an extension of the Phantoms, and will be called upon to help support the team in many ways–just as members were always ready and willing to do. It will be a charitable and philanthropic organization, as well. The non-profit status had already been achieved, and charitable certifications are on the way. Money raised through membership fees, sales, and events will be used for supporting charities unique to the Phan Club–but recognized in the community as an extension of the Phantoms. Why should you get involved? If you’re looking for a way to support your local hockey team more closely, and get involved in community endeavors of the organization, then this club is for you. There will be some exclusive perks–a special logo, some more interesting meeting venues and events, and reduced-price trips to see the Phantoms on the road. There will be viewing parties to watch away games. And, more. It can be as good and as involved as the membership wants it to be. How do you get involved? First, drop by their website, www.PhanNation.org, and add your name to the mailing list. Second, join using the online form. Individual memberships are available for $15–families for $25 and youth for $10. You can pay via PayPal, or arrange to meet an officer at the games, or join at a meeting. You’ll get a free black (we all have enough orange ones, right?) T-Shirt out of the deal! (one per membership) Then, go to their Facebook page and give it a ‘Like’ right here. In the future, you may even be able to join by dropping by their table on the concourse during select games–when this is available it will be announced on the video board. You do not need to be a season ticket holder to join. In fact, I think it’s an excellent option for those who love going to the games and supporting the team, but don’t want or can’t afford season tickets. Like any organization, there are sure to be growing pains–and the faces may change a bit over time. It might not be for everybody. However, right now the membership is impressive and the leadership is strong. The future is bright for this group–now officially recognized by the team organization and the ownership of the Phantoms. PS: By way of disclosure, I’m not an officer in the Phan Club–too busy writing goofy blog posts to do the work required. However, I’ll reiterate that the work required to achieve this status was significant, and I applaud those who were able to achieve it. Very well written, Kram. A truly outstanding achievement worthy of this great acknowledgment; the Phan Club consists of a really great group of folks, and I know a good number of people that can’t wait to be involved.